According to pastor-teacher John MacArthur “TBN has been dominated by faith-healers, full-time fund-raisers, and self-proclaimed prophets spewing heresy.” In other words, TBN is dominated by heretics. Heresy spewers include Kenneth & Gloria Copeland, Benny Hinn, TD Jakes, Creflo Dollar, Paula White and Joyce Meyer. Faith teachers such as these are notorious for fleecing the Christian flock. TBN is rightly referred to by some as Trinity Blasphemy Network. This begs the question. Why does it not bother Mike Huckabee that he’s linking arms with a “religious network” that shamelessly airs programs hosted by wolves in sheep’s clothing who prey on Christ’s sheep? Mike Huckabee’s weekly talk show premieres Saturday on Trinity Broadcasting Network, representing a programming shift for the Christian television giant. 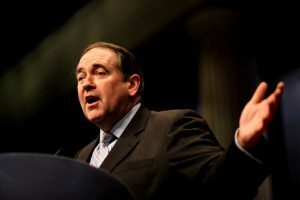 Hosted by the two-time Republican presidential candidate and taped just outside of Nashville, “Huckabee” will offer news commentary and feature political, musical and religious guests. Its look at current events from a practical and Biblical world view is a departure from TBN’s typical lineup flush with well-known Christian ministers, like Joel Osteen.